My debut novel, the Australian Shadows Award-winning 809 Jacob Street, is now available in paperback and digital formats from Amazon. Listen to Joey Blue’s Barstool Eyes song. Nominated a Notable Indie Book of 2013 in the category of Page Turners – Shelf Unbound magazine’s writing competition. “By effectively blurring the line between the inner and outer worlds of its characters, 809 Jacob Street gives new life to the standard haunted house story. A dark and powerful tale of small-town paranoia, communal and personal terror, and the reality of monsters. Fourteen year old Byron James wishes he’d never been dragged to Parkton. It’s a crazy sideshow of a town in the middle of damn nowhere, and he’s stranded there. To make matters worse, his two new friends – his only friends – turn out to be class rejects with an unhealthy interest in monsters. They want to discover the truth to the infamous monster house at number 809 Jacob Street. Joey Blue is an old bluesman who fell into his songs and couldn’t find his way out again. Now he’s a Gutterbreed, one of the slinking shifting shadows haunting the town’s alleys. When an old dead friend comes begging for help, Joey’s world is torn apart. He is forced to stare down the man he has become in order to rescue the man he once was – and there is only one place he can do that. 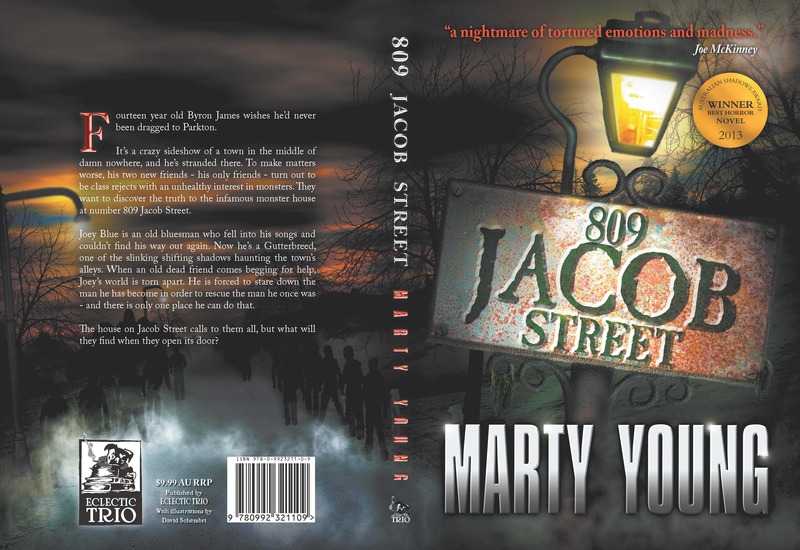 809 Jacob Street (and several forthcoming novels) is set in Parkton, a crazy sideshow of a town nestled in the foothills of the Coast Range, on the western edge of the Willamette Valley. Driving into town that first time (Welcome to Parkton, the Willamette’s Hidden Paradise, the sign says), the forested hills surrounding Parkton feel imposing, claustrophobic, like they were intent on swallowing the place and everyone in it whole, with the trees, the ancient Douglas-firs and oaks and pines, shuffling closer all the time to prevent escape. And those wooded mountains of Oregon’s Coast Range loom large in the background, a reminder of what hills became, given enough time. This town has no chance. There are trees everywhere too, like the advance party of a conquering army; maples with huge star-shaped leaves lining the main roads, their leaves a mix of green and gold, giant sequoias standing tall on corners….. Strange things happen in Parkton, no doubt due to those 11 ancient, coppiced hazelnut trees that form a ring about town. Who planted them–and why? Parkton was founded in 1853 by Charles F Longworth (Charlie, until he came into money through the goldrush of California in 1848-1855), who came west on the Oregon trail and took up a land claim, opened a general store, platted the land and surveyed a town site. No one knows why he called the place Parkton. Earliest recorded history explains how the Kalapuya burnt the surrounding area for clearing, only the setting of future Parkton always remained untouched, with the fire bending around those hazelnut trees. It was cursed ground, they believed, a place the others still walked. Somehow, The Symmes Institute, one of the leading scientific organisations in the world, is tied to the trees; they know the secret, they know where those trees lead, and it’s something they will kill to keep hidden. But it’s not just the hazelnut trees; Parkton is filled with madness. The northern end of Parkton has grown busier over the past couple of years ever since the new housing estate had been built, providing families with one thousand new homes nestled amongst rolling hills and forests of Douglas firs and oaks. Further north still, the road takes a tour though the forested foothills of the Coast Range before creeping past Parkton Asylum half an hour away. Perched atop a hill, the old hospital afforded its patients with a view over the town, to inspire or tease, it wasn’t clear, but also giving those in town a reminder of what lurked just in the distance. The residents of Parkton even have their own bogeyman, who lives out on Jacob Street. The parents use him to frighten the kids into behaving, least they be taken out that way and left for the Man of the House… It’s a threat the children take seriously. But why are the homeless drawn there–and how come so many homeless drift along the gutters of this town? He trudged on through the alleyways of Parkton, hiding from the world so he might suffer his embarrassment alone. He crossed empty streets and slipped down behind silent buildings, a solitary soul amongst a land of shadows. Revelations (novel) – ever wonder why 11 coppiced hazelnut trees ringed town? And why old Dr Sam Reynolds creeps out at midnight to listen to the ground before each one? Dr Reynolds used to work at The Symmes Institute, a scientific organisation with a long, mysterious history linked to Charles F Longworth, Parkton’s founding father. What was it that Longworth knew, and that The Symmes Institute will do anything to keep secret? Dr Reynolds knows, but will he be able to expose the truth before they get him–and will the Earth survive such a revelation?